A template for students to write their own word problem. Using a picture, tens frame, number line, equation, number sentence, and answer. Can be a journal activity. Use this while teaching word problems in math. Students write their own then trade with a partner and then solve each other's problems. Could be used with addition, subtraction, or multiplication. This useful package is designed to evaluate pupils understanding in designing a 2 step word problem. Pupils are required to complete the word problem with numbers that work. In doing so, pupils are tested on their mathematical thinking, reasoning and reasonableness. 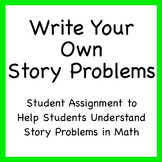 This template helps students write their own word problems using ANY skill. Students can use their creativity to write comparison problems using "how many more" and "how many fewer".